Today the Airbus A380 was officially revealed here at a big bash. Chirac and Tony Blair and everybody were there. No, I wasn't invited, but my daughter was one of the (250) hostesses telling people where to go. 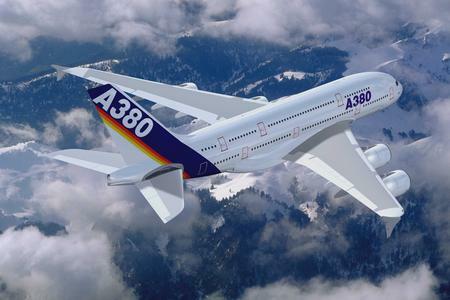 Airbus has passed Boing a while back in terms of being the biggest aircraft manufacturer. 57% of the market. And the new A380 is a huge thing that dwarfs a 747 and can carry up to 800 passengers, in two floors, and looking more like a hotel inside than a typical airplane. Airbus headquarters are here in Toulouse and this is where they assemble the planes, even if major parts are made in other places. The activity around Airbus is largely responsible for making Toulouse the most growing economy and population in France. And everybody here pays close attention. You could pretty much stop anybody on the street and they would proudly rattle off the specs of the A380. Lots has been done to pave the way for it. Custom-built barges and widened roads to transport the parts. Huge building for the assembly. And today the busses don't run in town, because the streets are blocked off so that Tony Blair and Gerhard Shroeder can drive to lunch undisturbed. The plane isn't going to fly for another couple of months. I suppose it will, even though I don't intuitively grasp how. It will have to fly over my house when it takes off, so I guess I'll believe it then. But you won't see it in your local airport before next year. Richard Branson says he'll equip his Virgin versions with gyms, beauty parlours, bars, casinos and double beds. I suppose not in the economy class, but it still sounds like fun. 18 Jan 2005 @ 16:43 by hgoodgame : Fly over your house on take-off? LOL, Ming, you better strap everything down now! We used to live close to and right under the landing/take-off pattern at the Santa Barbara airport which was bad enough. Nothing really big ever took off from there except Hughes' Spruce Goose once in a while. Marie-Therese was there most of the day and will be there tomorrow too. It was from a temp agency, *something*-One, I forgot. She was equipped with a fancy Airbus uniform and everything. And they pay, but not much. 7 euro something per hour, and she had to show up for some unpaid training first. And we had to drive her. But then she can put that on her CV, at least. Actually we're just a little bit off from the take-off and landing path, which makes the noise nothing much. We've lived by an airport before and hardly notice it. But usually it isn't huge planes here. The biggest thing is the transport plane that brings parts to Airbus, the "Beluga", but it doesn't make much noise either. I must say I'm glad Airbus and the Canceropole project will lead our town to the top, in terms of image, especially in Europe. Which is great for us! ...you know you're talking to a machine? How much fuel does an airmonster like that consume and how much greenhousegas stuff does it release into the atmosphere? What happened to concerns over the environment? Personally, the bigger they make 'em the more I want to find alternative modes of travel. Like horse-drawn carriage. 22 Jan 2005 @ 13:51 by nemue : I can't wait.. When you live downunder travel to Europe and America is such a bore. Just to be able to go the gym, have a facial - bliss. Hear what you say Natalie but I for one do not agree with horses pulling us around in carriages. I guess a machine couldn't discriminate the visual ' authentification ' code, could it? 22 Jan 2005 @ 15:48 by jstarrs : Good question....!!LOL!! Please can you tell me howmuch cost single ticket? when this type of flight will be landing in African country? . Or just made to fly reach people? Thanks to repply my question. View this site and get what you have wished for so just get professional term papers and essays and believe in miracles of our best writing service. That's hard to find an academic writing company, which can be dedicated to university students' progress. Nonetheless, it can be real to buy custom essay online. My daughter sat in Raleigh, NC thiognt (Sat 7/27) for four hours and then when she finally got out of there to Minneapolis, the next flight out by that time to get her home would have been 7 a.m., and that would have only been to Omaha, tomorrow morning. She ended up having to rent a car and drive home because evidently even that flight wasn't a definite. Now I have to sit up all night worrying about her getting home. I hate NWA. They didn't even offer them anything to eat while they were stuck on the plane the whole time, and they couldn't even get off to find a different flight or go to a motel. 24 Sep 2016 @ 04:43 by Marian @36.83.93.202 : Just great!